If your organization is like most, you need to track and report on learner activity. And when you use Articulate software to author an e-learning course, publishing it to a learning management system (LMS) is really easy. But sometimes your course doesn’t behave as expected in your LMS. Why? More often than not it’s because each LMS implements tracking communication standards (AICC, SCORM, or Tin Can API) a little differently—and that can cause problems. 2. Use a supported e-learning specification. When you publish, be sure to select a communication standard that’s supported by your LMS. 3. Zip your published output. Most LMSs require you to zip content before you upload it. And it must be zipped in a certain way, or your LMS won't accept it. 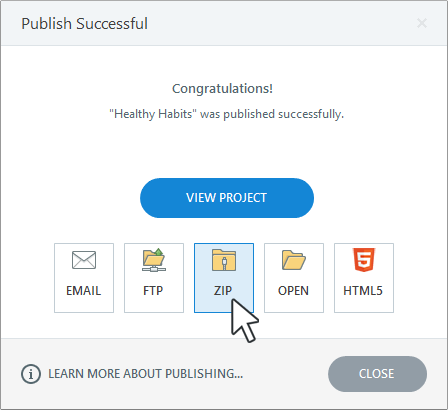 The best way to zip your course is to click the Zip button on the Publish Successful dialog in your Articulate software. If you manually zip your published output, be sure to zip only the course files, not the folder that contains the course files. 4. Contact your LMS provider. If you still can’t upload content to your LMS, contact your LMS provider for specific instructions. 1. Upload the published output to your LMS. Make sure you’re viewing the course from your LMS and not on your local hard drive. Security restrictions from your computer, web browser, Flash Player, and network can interfere with published output when it's viewed locally. Upload the published output to your LMS, then view it. 2. Identify the launch file. If your LMS requires you to manually identify the launch file for each course, make sure you’re pointing to the correct launch file. 3. Don’t launch the player in a new window. 4. Update Adobe Flash Player. For Windows 8 and later, install the latest Windows updates to get the latest Flash Player version. For Windows 7 and earlier, install the latest Flash Player version here. 5. Use a supported version of Java. 6. Delete the browser cache. 7. Test your course at SCORM Cloud. If none of the steps above resolve your issue, test your published course at SCORM Cloud and compare the results with your LMS. If your content works properly at SCORM Cloud but not in your LMS, open a support case with your LMS provider to troubleshoot the issue. Your LMS provider may request a debug log to help identify the problem. Click here to learn how to generate a debug log. If your course doesn’t play correctly at SCORM Cloud either, submit your project file to us for review. We're here to help. 1. Change the reporting status. If your LMS tracks a completion status and a success status, choose Passed/Incomplete or Passed/Failed. The other pairs report only completion status. 2. Select a tracking option. When you’re publishing a course authored in either Articulate Storyline or Articulate Presenter, click the Reporting and Tracking button and specify whether you want to track completion based on the number of slides viewed or by a particular quiz in the course. 3. Check the Resume setting. 4. Close the web browser (Studio '09 courses only). If you authored your course in Studio ’09, instruct learners to close the browser window (or browser tab) when they finish the course. Their results and resume information will be communicated to the LMS when they close the browser. 5. Upload Tin Can API content to an external server. 6. Determine if AICC content is in a cross-domain environment. If you published for AICC and you’re hosting the published output on a server that’s separate from your LMS, you may be facing an AICC cross-domain limitation. You’ll need to add a file to your published output to resolve the issue. See this article for details. If your course still won't track or resume, test it at SCORM Cloud and compare the results with your LMS. If your course doesn’t work at SCORM Cloud either, submit your project file to us for review. We'll be glad to help.